Last November, 7 Wonders was released to critical acclaim and almost immediately landed a top spot on many peoples best of 2010 lists. Jump spring 2011, and it is named as a nominee for for the first ever Kennerspiel des Jahres (German "expert" game of the year award), only to win the title a few weeks later. It should come as no surprise then that this game was destined for expansions. 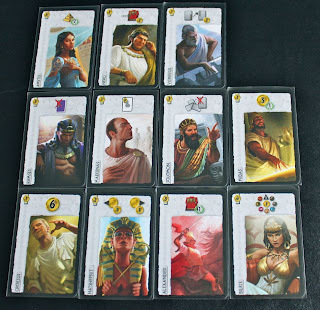 7 Wonders: Leaders introduces a completely new card type to the game, and manages to do so in a way that does not greatly change it while still adding an interesting new depth. 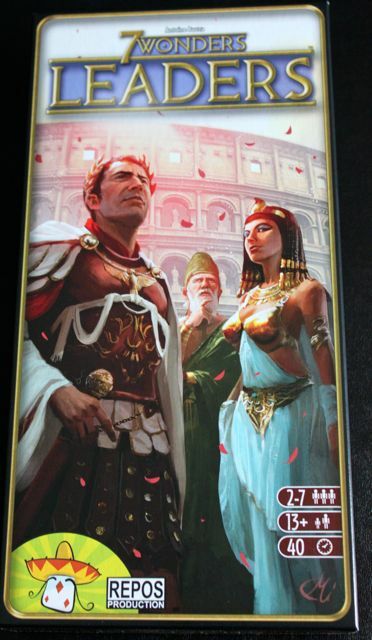 In the box you will find 36 leaders cards, 4 new guild cards, additional coins valued at 6 each, and a new wonder board - Rome. At its core, Leaders is all about using these new cards to bring glory to your city by way of giving the players unique ways to score additional victory points. Each leader will present a different condition for scoring victory points that only the player who puts them in play will benefit from. In some cases, this is straight up "you get [x]vp for each [card type] you have in play" (ex, Pericles will give you 2vp for each red military card you have in play). Others will let you build certain types of cards for free, let you build certain types of cards for one resource less, grant shields, types of science, money from the bank, and so on. Some unique cards will grant you 7 victory points for each set of 7 age cards you have in play (Plato), any defeat tokens you should receive during conflict resolution go to the neighboring city (Tomyris), or allows you to buy any resource from the bank for 1 coin per turn (Bilkis). With Leaders in play, the game now starts off with a mini-draft of leaders cards. Each player takes 4 leader cards, selects one, passes the remaining to the right, and so on until each player has 4 leader cards. Next, players will have the opportunity to choose a leader and put them into play by paying its resource cost (all leaders resource cost is coin based), followed by playing the first age as normal. Before each age players will be able to put an additional leader into play, having a maximum total of three different leaders by the end of the game. At games end, scores are tallied as they would normally be, with the addition of any and all points scored by having the leader cards in play. Player with the most points wins, naturally. The expansion also adds some additional guilds and a new city to the game that all benefit from the addition of leaders to the game. A couple notable guild cards are the Diplomat's Guild, where you earn 1vp for each leader in the neighboring city, and the Courtesan's Guild, which lets you gain the benefits of one of the leaders in the neighboring city. The city of Rome gives you the Colosseum as your wonder to build. Rome has no starting resources, however it benefits from having a reduced cost for leaders. Side A allows players to recruit their leaders for free, and its 2 wonder stages gives a total of 10vp. 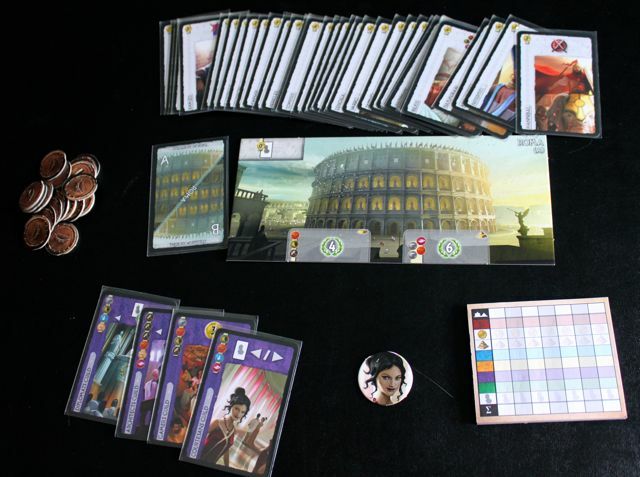 Side B allows for a discount of 2 coins per leader to the owner of Rome, as well as a 1 coin discount to its neighbors. This may not seem great, but when you consider that its first stage of its wonder grants them an additional 4 leader cards, and stage 2 and 3 lets them recruit an additional 2 leaders, it a fair trade I think. All in all, I liked playing with the Leaders expansion. I found that the leaders cards helped me be a bit more purposeful in what cards I chose to put in play. Typically I choose to avoid playing military cards as I typically would lean towards building up science and civics cards. 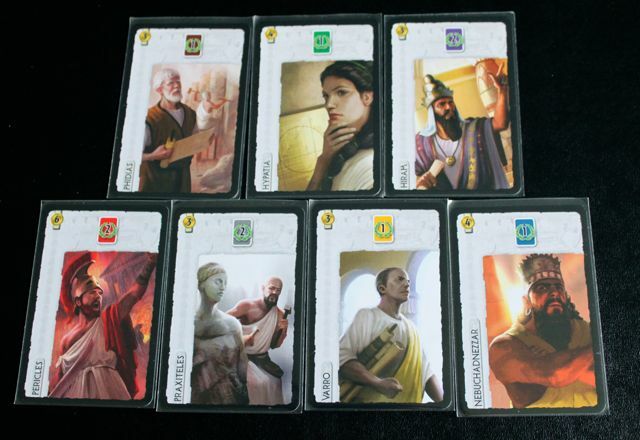 When dealt my leader cards, I ended up with Caesar (2 shields), Alexander (1 vp for each victory token), and Pericles (2vp for each military card). Because of these, it caused me to have to take a militant route in order to take advantage of my leaders. In turn, I only lost by 3 vp (I don't win much). The only issues we had were aesthetic. The colorations to backs of the guild and city cards did not match with our base set. This is a minor thing in the greater scheme of things, and really is only an impact to us as to how we choose starting cities and which guilds to not include (we take the "pick a card, any card" approach, so it stands out). Also, the 6-value coins from the expansion are cardboard, which will match well with folks who have a second printing of the game. If you have a first printing (like me) your wooden coins will not match at all. Again, this is a minor thing, as it doesn't impact its gameplay, but it can be a major issue for some. Aesthetics aside, its a solid expansion to an already great game that actually adds value to it. With such a variety of leaders and bonuses, it definitely makes for wanting to play more to see what types of combinations do well. 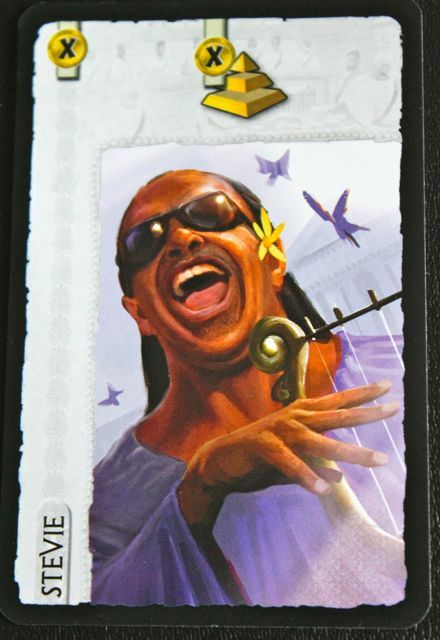 Stevie is a promo card you can only get from Speilbox magazine.